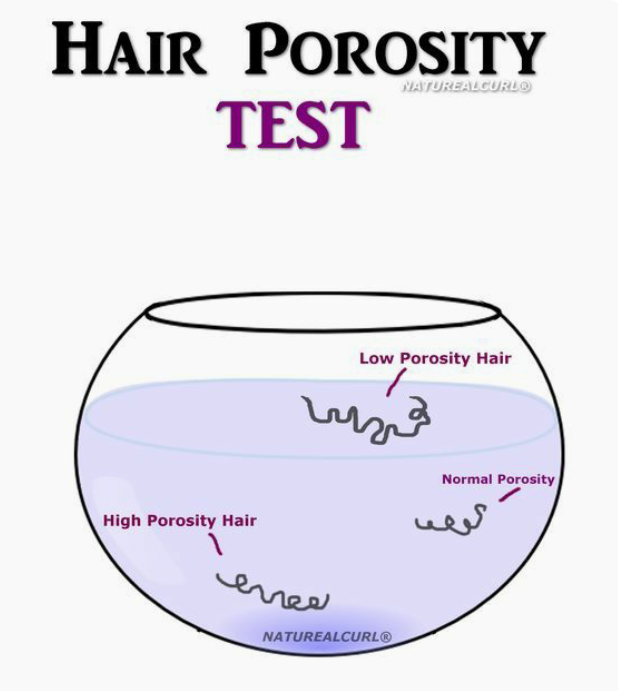 Firstly to determine hair porosity, take a cup of water and place clean, shed hairs inside the water. Wait for 30 seconds and do not touch the cup or hair. If the hair floats, it’s low porosity, if it sinks to the middle of the cup, it’s medium porosity and if it sinks deep inside it’s high porosity. High Porosity hair is either a natural characteristic of hair or caused by damage. Because the hair cuticles are highly raised or chipped, high porosity hair absorbs and loses moisture quickly. This can make it difficult to care for hair and keep it moisturized, but there are some tips that can help. ■Close The Cuticle: After washing and conditioning, do a final rinse with an apple cider vinegar mix 1 part apple cider vinegar and 3 parts of water. And before moisturizing and sealing, spray hair with aloe vera juice or gel to help close the cuticle. ■Use Heavier Moisturizers and Sealants: Opt for creamy leave-ins, and seal with heavy oils and butters, like shea butter and castor oil to help prevent moisture loss. ■ Do Protective Syles Using Your Own Hair: Avoid protective styles using extensions to help retain moisture in hair. Extensions, whether with synthetic or real hair, can pull moisture out of hair making it drier and prone to breakage. ■ Wash With Shampoo To Remove Build-up From Hair and Scalp: Hair retains more moisture when it’s clean, so limit constant use of cowashes and cleansing conditioners to ensure hair is able to absorb as much moisture as possible. 5. Incorporate regular protein treatments in regimen: Protein treatments help to repair high porosity hair due to damage allow it to retain more moisture. Low Porosity hair, unlike high porosity hair, has tightly sealed cuticles making it difficult for water to even penetrate the hair. It’s also prone to build-up since products cannot penetrate the hair shaft. To effectively care for low-porosity hair, check out the tips below. ■ Limit Protein, Silicones, and Heavy Oils and Butters: Because low-porosity hair is prone to build-up, you’ll want to avoid all things protein, silicones, and heavy oils and butters. Make sure you read the label before purchasing a product to ensure that its free of these ingredients, or at least has them farther down the ingredient list. ■ Use Warm Water to Wash Hair: Heat helps to open up the hair cuticle making it possible for moisture to enter the hair shaft. When washing the hair, use warm water to help remove build-up that may be on or in the hair shaft. keep up posting these types oof articles or reviews. I wass able to find good advice from your articles. sure whhere to start. Do you have any points or suggestions? You can register on blogger.com with your Gmail account and follow the instructions to create a blog. Then you will need to open google webmaster search console to verify your blog in order to appear on search engine. Then start creating blog post and publish, you can search on google on how to improve your blog and follow the directives given. work and reporting! Keep up the very good works guyhs I've added you guys to blogroll. Thank you so much, we appreciate your kind gesture. the feeds additionally…I'm happy to find a lot of useful info right here within the put up, we want work out extra techniques in this regard, thanks for sharing. Thank you for finding them useful, that means a lot to us. Please when you get an email, just scrolled down and check for the option of opting out. I am not controlling on my end so can't do that. that this write-up very pressureed me to try and do it!